Welcome to our night sky page. We’re so happy you’ve landed here. 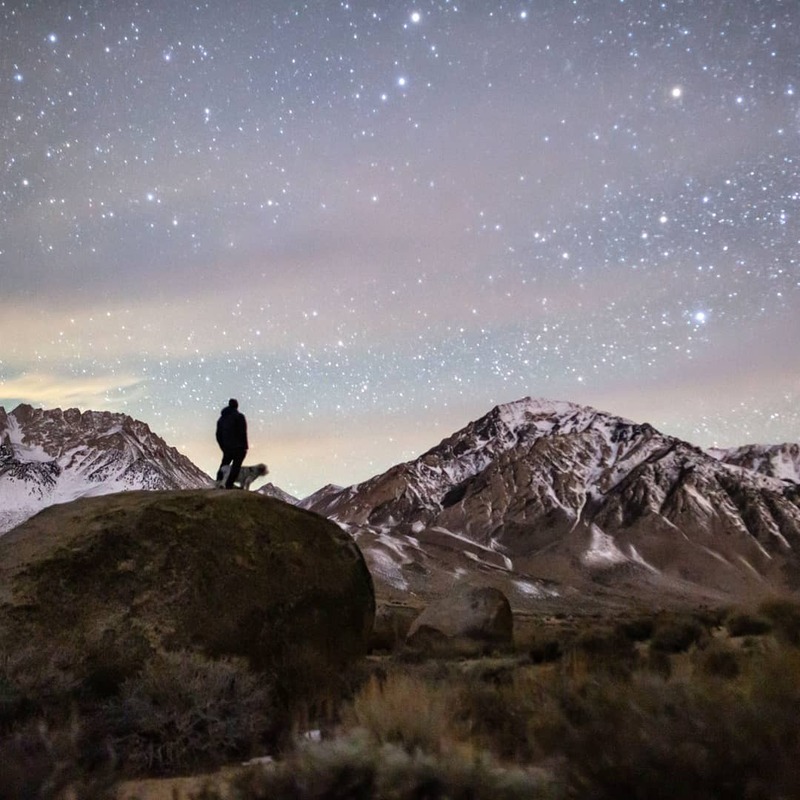 This interactive guide to stargazing in the Eastern Sierra will help you learn more about a night sky experience that’s only possible in a few remote places in the world now. Did you know that there are countless children and adults who have never seen the Milky Way? 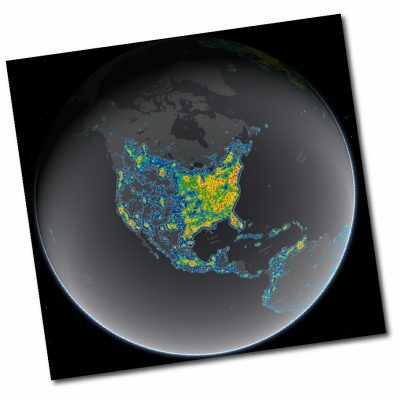 Experts say that 80% of North Americans and one-third of humanity can no longer see the Milky Way from where they live due to light pollution. 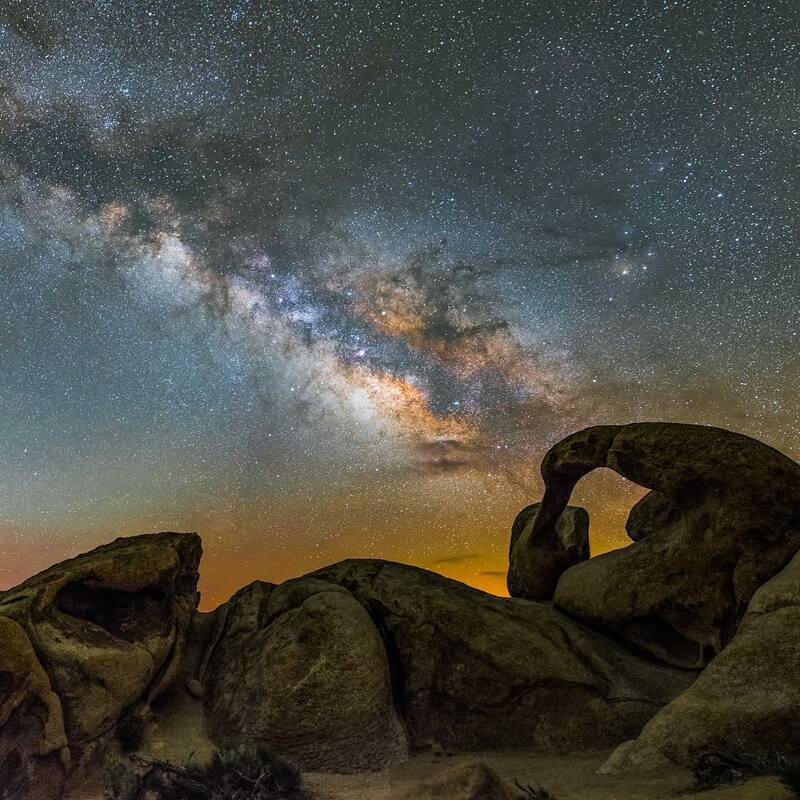 The Eastern Sierra still has incredibly dark, clear skies and the region is within relatively close proximity to almost 30 million coastal California residents – many of whom are subject to excessive light pollution. Here in the Owens Valley on the east side of the Sierra Nevada there are many easily accessible places where night sky viewing is exceptional. Visitors to our area tell us that they are awestruck by the abundance of stars and clarity of the Milky Way on a moonless night. The Milky Way is as obvious here today as it was when Galileo first focused his rudimentary telescope at this phenomenon in 1610 and discovered that it was made up of stars. The night sky has captured the human imagination from time immemorial. Scientists, artists, philosophers, photographers, lovers, and people of all cultures have gazed up at the sky in wonder. What makes the Eastern Sierra so special for night sky viewing is that so many of the settings have spectacular natural beauty of their own. Outdoor enthusiasts, astronomers, and photographers will be enthralled and engaged by a night out in the Eastern Sierra. 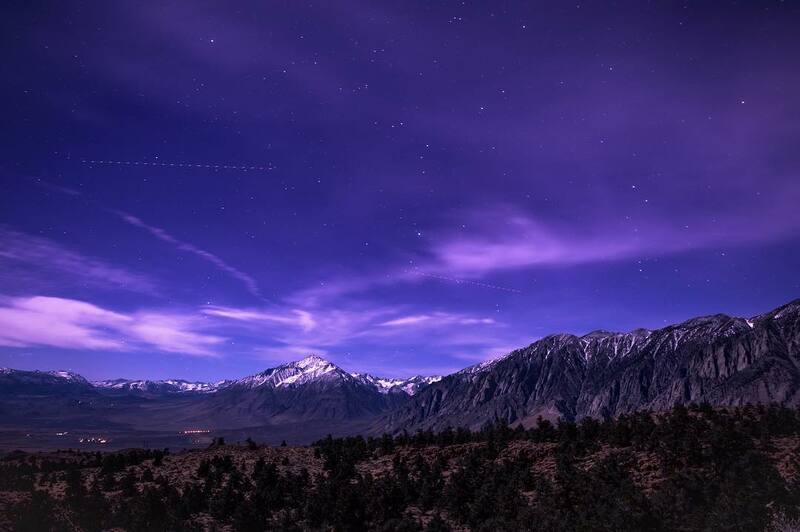 The lack of light pollution in the Owens Valley is largely due to the fact that it is one the least populated regions in the country. The valley is about 100 miles long by 6 to 18 miles wide, with a land area of about 3,330 square miles and has a population density of just 5.25 persons per square mile. It is considered to be one of the deepest valleys in the United States. Situated at about 4,500 feet above sea level the valley floor is flanked by two of the highest mountain ranges on the continent. The magnificent and well-known Sierra Nevada rise up dramatically on the west side of the valley to over 14,000 feet. The White and Inyo Mountains are the gentle giants to the east that rise as high in some places. As well as being sparsely populated, the Owens Valley has a semi-arid climate that is characterized as ‘high desert’. The massive Sierra Nevada range casts a ‘rain shadow’ over the valley and statistics show that there is about a 92% chance of clear weather, which adds up to about 335 clear nights a year. The range also ‘shades’ the valley from the glow of the densely populated central and coastal regions of California. All this contributes to the region having low light pollution, clear air, and very few cloudy nights. 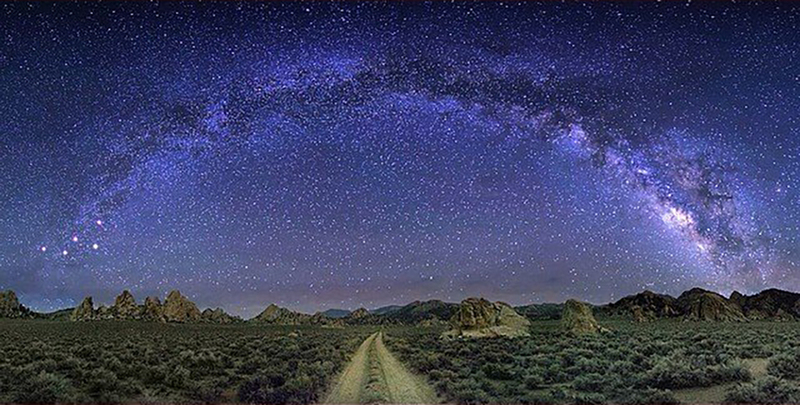 The heart of the Eastern Sierra is perfectly situated for a brilliant night sky experience. In addition to seeing the stars in the sky, visitors can tour a state-of-the-art radio telescope array. The Owens Valley Radio Observatory (OVRO), run by the California Institute of Technology (Caltech), is one of the largest university-operated observatories in the world and hosts numerous projects in radio astronomy and cosmology. Affectionately known as “Big Ears,” it is situated just east of Big Pine, 15 miles south of Bishop. 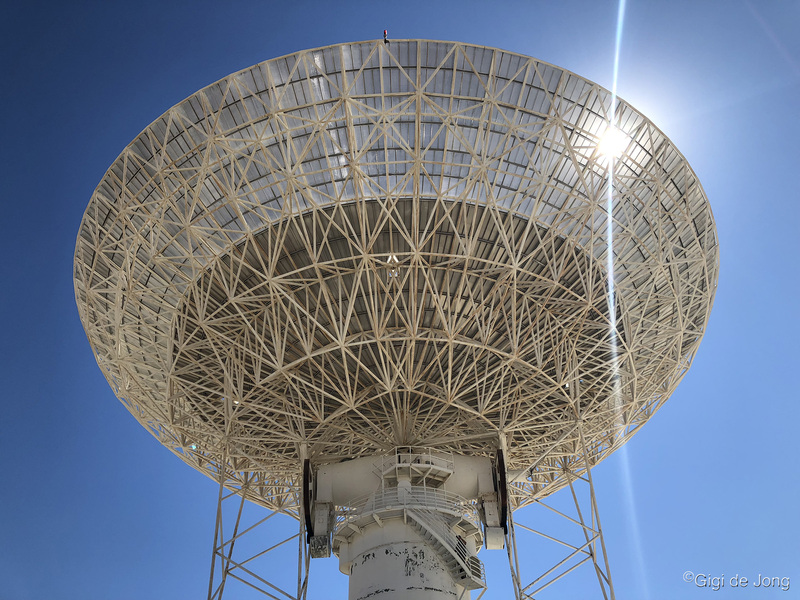 It was brought into operation in 1958 with one 32-ft radio telescope, which was built at the Caltech’s Palomar Observatory and relocated at the newly established OVRO. By early 1959, the first 90-foot antenna was operational and soon thereafter a second one was listening to outer space. Today, the scope of the operation is extensive and world-class. OVRO now has the capability to ‘listen’ and analyze data using multiple different types of radio telescope technologies. 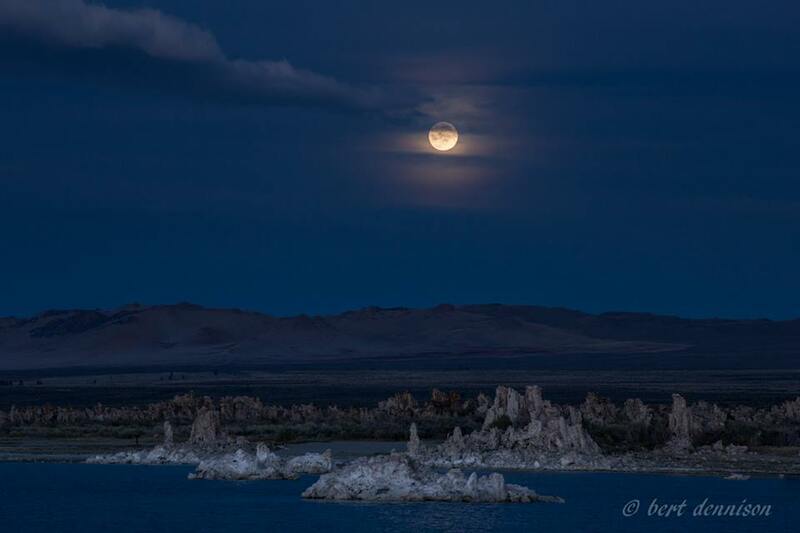 Night sky viewing is a year-round activity in the Owens Valley and should be coordinated primarily with moon phases, the seasons, timing of astronomical events, and the weather. On a cloudless, new moon night (when the moon is not illuminated by the sun) the stars will shine brightest for the longest period of time. The diverse landscape of the Owens Valley, with the rugged mountains on either side, has many beautiful places for super dark skies that can be reached by car. Some high elevation destinations are not accessible during mid-winter, but many lower elevation spots are perfect for a few hours of stargazing, or an overnight camping expedition for the full nighttime experience. Summer months offer warm, dry nights that make this a perfect time for teaching kids about the cosmos. Cold, clear winter nights present optimal conditions for night sky viewing. There are two factors that contribute to this. One is the nights are longer in the northern hemisphere. The other is that cold air holds less moisture, which means more transparency and greater clarity. From late summer to early fall is the best time of the year to see the Milky Way. The brightest portion of this ribbon of stars arcs almost directly overhead from the southwest to the northeast parts of the sky. This starry arch can be seen closer to the horizon as we move into winter. In spring it will be hidden as it runs along the horizon, where the denser atmosphere near the ground will make it invisible. In summer it will begin to rise again. Other celestial objects to look for in the sky are the planets, comets, and meteor showers. These are also more visible in our night sky on dark, cloudless nights. Astronomy can be a fun and rewarding activity for the whole family. It’s as easy as looking up at the stars. A new smart phone is a great way to capture some simple snapshots of the night sky and there are many excellent star apps that can provide maps, charts, and information on what you will see in the sky. 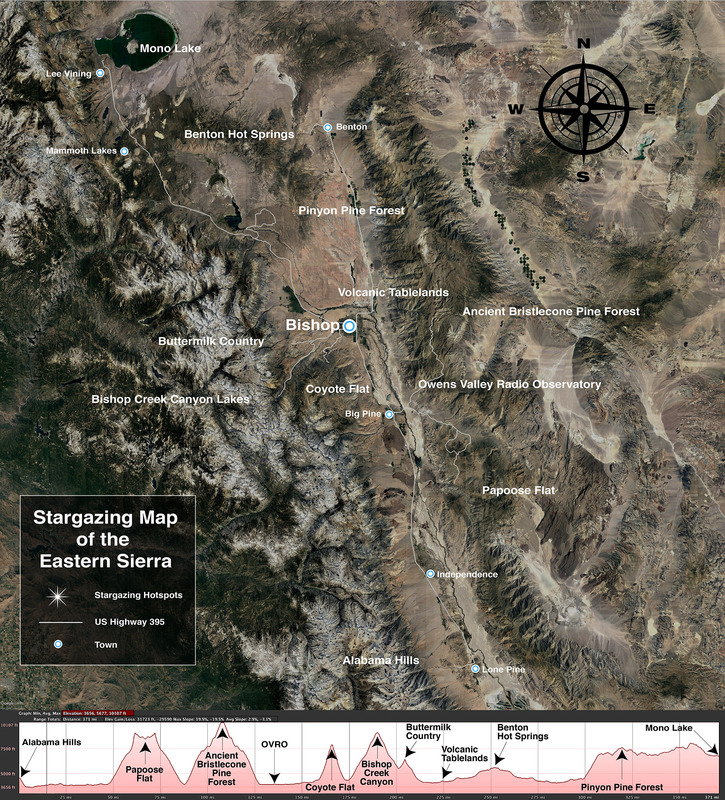 Some of the destinations for good star viewing in the Eastern Sierra will not have cellular phone connection and so a good paper star chart would be worth including in your astronomy kit. In order to see more detail and definition of the celestial bodies in the night sky bring a telescope along with you. Professional grade night sky photography may require more than a smart phone and basic photographic equipment should include a full-frame camera, a fish-eye lens, and a tripod. There are many good tutorials online for beginning night sky photographers. When planning your trip to view the night sky consider all the various aspects that will affect what you will see in the sky. Keep a close watch on the weather and what each season will bring into view. Here are a number of informative links that you can use to research and plan your trip. 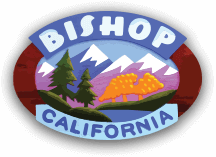 For more detailed information on local weather, as well as other things to do and see in and around Bishop, call the Bishop Visitor Center at (760) 873-8405. Our friendly, knowledgeable staff can help you plan your trip to get the best possible experience. Remember the weather in the Eastern Sierra is unpredictable almost any time of year. Be prepared for sudden changes, especially at higher elevations, and bring clothing layers to stay warm and protected. Some of these high elevation destinations will not have any services, food or water available so make sure to carry enough (and a little more) of everything for everyone in your party. Click here to download PDF format of this map. 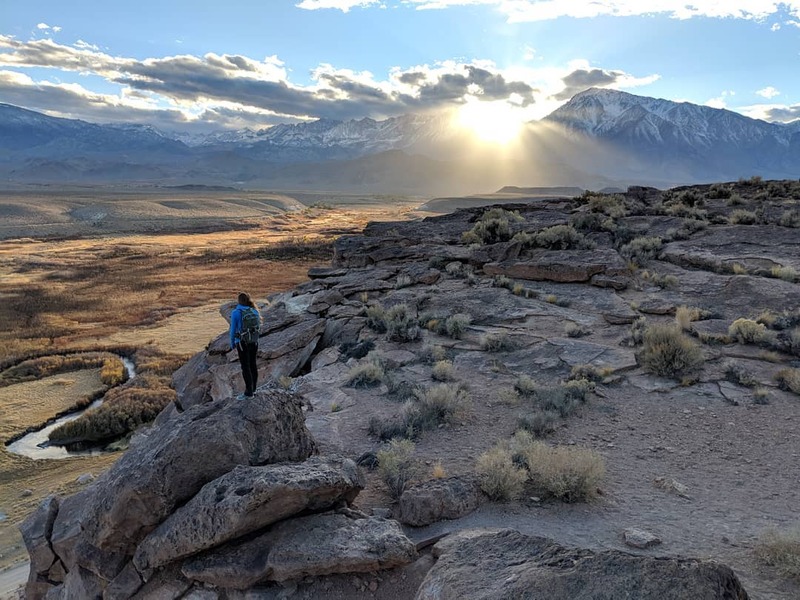 Along US Highway 395 from Lone Pine, 60 miles south of Bishop, to Mono Lake, 66 miles north of Bishop, there are innumerable places to stop, hike, bivvy for a few hours, or camp overnight for stargazing. Follow the stars on the map to see the locations of these great stargazing places. A few miles west of Lone Pine is the Alabama Hills recreation area where a view of Mt. Whitney, the tallest peak in the contiguous USA, can be seen through a natural rock arch named the Mobius Arch. A glittering night sky with the sinuous path of the Milky Way as the backdrop is a sight to behold on a moonless night. 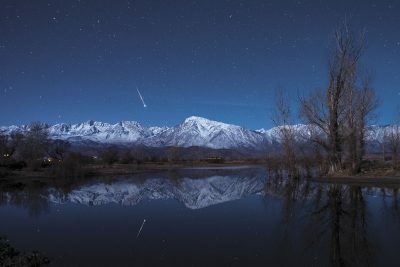 During a full moon in winter the skyline of the Sierra Nevada and Mt Whitney will be starkly white in an azure sky with a sprinkling of twinkling stars. Papoose Flat is known for its unique landscape of randomly isolated granite spires that dot the flat, and for the marvelous views of the Sierra Nevada crest and Owens Valley below. It is situated almost directly above Tinemaha Reservoir, at the crest of the Inyo Mountains, which separate Saline Valley from the Owens Valley. This high desert flat is a circular, tree-less expanse of scrub desert dominated by these tall granite spires rising out of the ground at irregular intervals. It has a sense of being ‘otherworldly’. It’s a place where you can still keep your feet on the ground and have an extraterrestrial experience looking up at the night sky. The drive will require a high clearance, 4-wheel drive vehicle, with an experienced OHV driver at the wheel. Take plenty of water, food, clothing layers, and extra gear for everyone in your party. A trip up here can be a delightful overnight, summertime adventure. The Owens Valley Radio Observatory is operational year-round, and the facility offers free public tours on the first Monday of every month – unless it is a holiday, then the tour is on the second Monday. Tours begin at 1pm and last about an hour. Reservations are not required. Tours for school groups and large parties can be prearranged for other times by contacting OVRO at (760) 358-6410. Here is a link to a quick guide to the Owens Valley Radio Observatory on our blog page. Directions to OVRO can be found here. This is a warm weather destination high above Bishop. The glow of the town below will do little to impede the sparkle of stars above. The view over the valley, across the tablelands, and up to the White Mountains beyond is an awesome sight to behold on any night. A starry night just adds the glitter to the golden glow of lights below. Access to lookout points along the crest is along a low standard, rough Forest Service road – route designation 07S10. It is a steady climb that is best done with a 4-wheel drive, high clearance vehicle. This is great experience to combine a daytime and nighttime adventure and camp up on this remote ridge. A 20-minute drive west out of Bishop on W. Line St. – SR 168 will take you up to the high Sierra lakes in Bishop Creek Canyon. The lakes are accessible by car during the warmer months of the year, but only accessible on skis or snowshoes during winter. 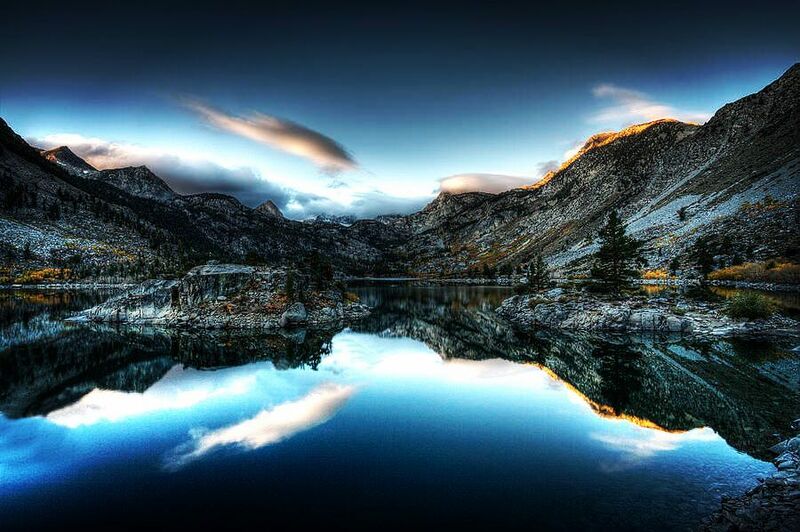 Lake Sabrina or South Lake are picture postcard perfect almost any time of day, any time of year. Plan it just right and you could have a perfect photo op trip. New moon. Early fall. From late afternoon into the darkness of night. You could be rewarded with the first turning of the leaves when the sun is just setting then the Milky Way arching overhead after the sun has set. Bring plenty of layers, snacks, water, and a comfy camp chair to while away couple of hours in one of the most spectacular settings on the planet. Really! Close to Bishop and presenting a magnificent view of Mt. Tom and Wheeler Ridge is Buttermilk Country. Take a 10-minute drive west from town on W. Line St. – SR 168 to Buttermilk Road and turn right. Head out into Buttermilk Country as far you wish or can (after about 10 miles on this road you may need 4x4 and high clearance) and find a turnout or clearing to spread a blanket or pitch a tent. A summer night out here is a great place for a romantic date or a late-night picnic with kids under a canopy of sparkling stars. This volcanic plateau rises about 300 feet vertically just a few miles north of Bishop. It’s an expansive landscape with incredible views any way you look – including up! It is one of the most expansive views of the sky in the area. The tablelands were formed about 760,000 years ago when a massive volcanic eruption emptied the magma chamber below the area that is now the Long Valley Caldera, about 22 miles northwest as the crow flies. It released very hot ash that subsequently cooled and became the soft rock we now call Bishop Tuff that makes up this escarpment. Follow US Highway 6 north out of Bishop for 2 miles and turn left onto 5 Bridges Rd. Follow the paved road for 2 miles and, where the pavement ends, continue straight ahead onto the dirt road, Casa Diablo Rd., that ascends the escarpment. Drive for a few miles and pick a turnout where you can stop and stare skyward for a few hours.  If you spend some time here, and identify the North Star, pick out a constellation you can see how it appears to move across the sky. Further up the volcanic tablelands the landscape becomes more treed. This is due to the higher elevation here that receives more snow in winter. The snowmelt seeps into the ground to provide more water for plant growth. The area can be accessed by driving across the escarpment on Casa Diablo Rd or from the Owens Gorge Rd opposite Tom’s Place. The latter will cross the dam at Crowley Lake and wind through the pinyon forest until you reach the Benton Crossing Rd. 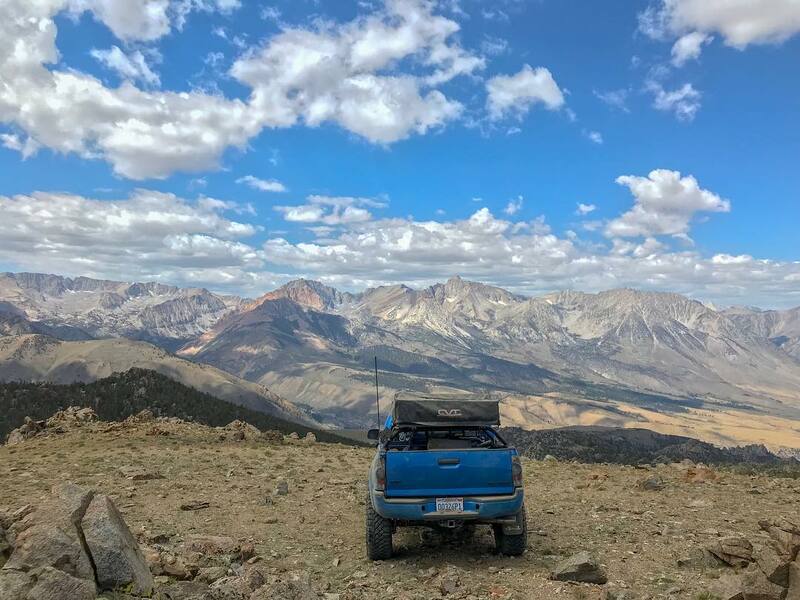 There are numerous turnoffs and turnouts along the Owens Gorge Rd that go to lookout spots above Long Valley that look north and west toward Crowley Lake and Mammoth Lakes. 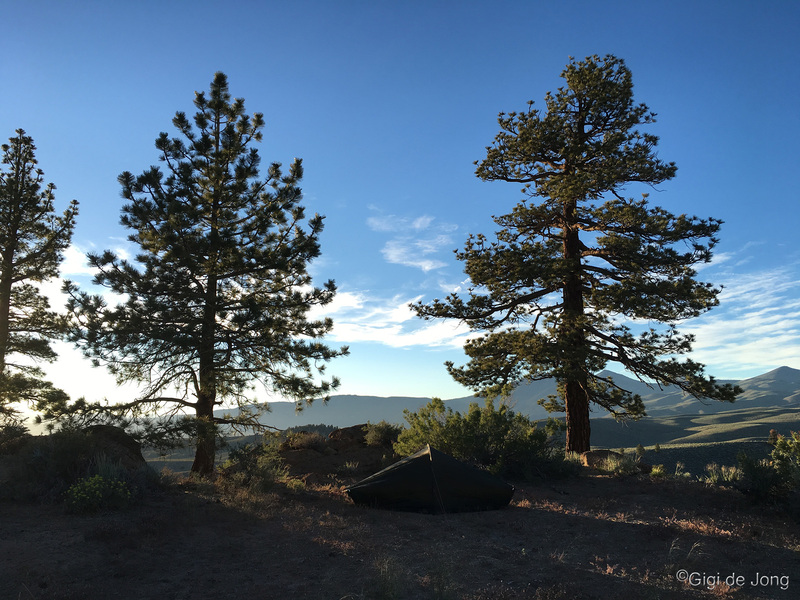 There is a vast network of Forest Service roads in the pinyon forest with excellent dispersed camping sites. It’s a wonderful place to teach kids about our natural world from the rocks on the ground, to the trees that grow and animals that live in the forest, to the stars in the sky above. This is definitely a summer destination. 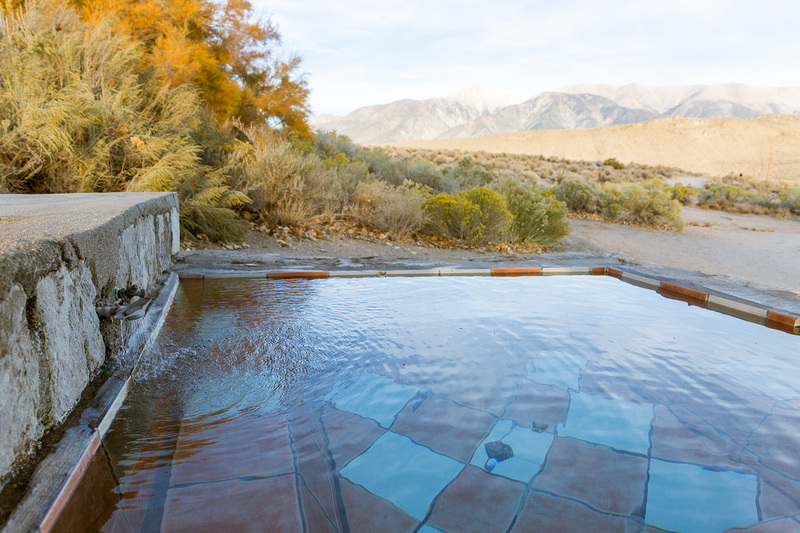 This delightful Inn at Benton Hot Springs might be the luxury version for a stargazing weekend in the Eastern Sierra. This beautiful and tranquil resort is located in the historic town of Benton, one of the oldest existing towns in Mono County, just 38 miles north of Bishop on Highway 6. The resort is open year-round and offers rustic elegance in each of the seven rooms in the historic house, all with access to private and semi-private hot tubs. Spend a night under the stars in one of the 10 campsites, each with its own private hot tub. It’s secluded, quiet, and very, very dark on a moonless night. Are your stars aligned for a romantic night out? High above Bishop is the Ancient Bristlecone Pine Forest. 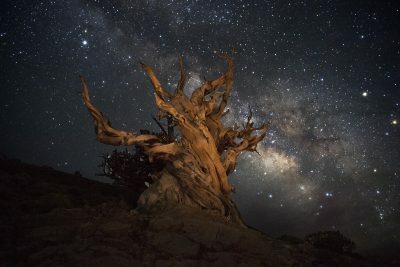 These trees, the Great Basin bristlecone pine, are the oldest living non-clonal organisms on earth and, if trees could speak, they might tell us of a slightly different sky than the one we see now. The oldest tree, Prometheus, is a little over 5,000 years old and was just a sapling when the star Thuban was the pole star at the time when the Egyptian pyramids were being built. From Bishop head south toward Big Pine for 15 miles, turn left onto CA168 East. In 13 miles turn left onto White Mountain Rd. About 8 miles along is the Sierra View Overlook and about 3 miles further you’ll reach the Schulman Grove Visitor Center. This is a beautiful drive of about an hour (38 miles) on a paved, winding, mountain road with an elevation gain of almost 6,000 feet. The interpretive center, open annually from approximately mid-May to November, weather permitting, has a large patio with picnic tables and boardwalks around the center from which many of the old trees can be seen. A late summer night up here offers a view, not just to the valley below and the stars above, but a window to our past and our future. Near the junction of US Highway 395 and Highway 120 west, the Tioga pass road into Yosemite National Park, sits a most magnificent lake – Mono Lake. (Pronounced Moh-No.) This lake is a large, shallow, saline soda lake that lies in a closed basin. The ‘tufa towers’, calcium-carbonate spires and knobs are the unique feature of this lake, which is a protected California State Park. A nighttime visit here has an eerie, alien look from the terrestrial to the extraterrestrial. The Mono Basin Scenic Visitor Center is located near Lee Vining, 65 miles north of Bishop on US Highway 395. A half mile beyond Lee Vining turn right onto Visitor Center Dr. The center is closed during the winter months. Nearby, a self-guided nature trail is open 24/7.